Inspired by the demanding hike to the Col de la Croix du Bonhomme a few days before, our planned hike for Wednesday was to head up from Les Contamines and climb the western flank of the valley to Mont Joly, part of the Beaufortain massif, which at 2525m should have afforded excellent views over the peak of the mighty Mont Blanc, Europe's highest mountain at 4810m and its massif. 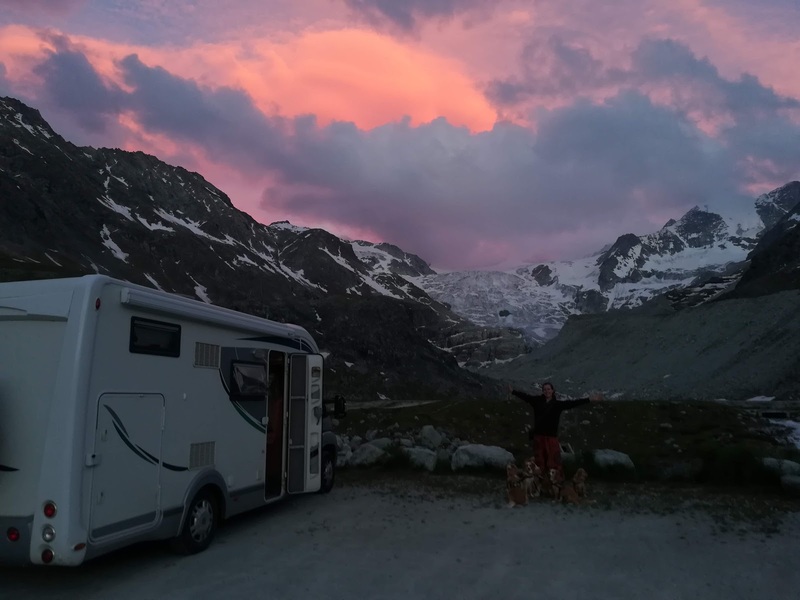 After the previous two rainy days in the motorhome, we were chomping at the bit again to reach the higher paths and with the sunshine returning we set off early. We found the start of the trail very close to our motorhome spot, just past the end of the cable car parking of La Tapia. We set off on a narrow road which passed through a small hamlet and then snaked its way uphill, already exciting us as with each switchback more of the snowy peak of Mont Blanc was revealed. Making easy progress on the road, after a short while we reached a private refuge, where the route turned off to the right, heading steeply uphill on a track through a wooded area. Emerging from the cool morning air of the woods, we were soon warmed by the bright sunshine. A stiff and incessant climb followed, but up to around 2000m we enjoyed a remarkable view in the clear air right over to Mont Blanc, still more than 3km above our heads! As we neared the summit of Mont Joly, what seemed like the only cloud in the sky suddenly blew up and as we climbed higher it obscured our view. On reaching the col at La Combaz at 2415m we were now deep into the cloud, with only brief thinner patches giving us a temporary view of the valley to the west towards Megeve. Modifying our plans we redirected our steps and rather than make for the summit of Mont Joly, we instead turned left at La Combaz and followed a narrow ridge line following signs to the peak of Aiguille Croche. The cloudy conditions as we traverse along the narrow ridge line continued as the cloud sadly seemed to be blowing through in the direction we were headed. Esther found this a good thing in some places as the cloud obscured the extent of the drop to the side of the path, which was very narrow at times, or had even had to be recently rerouted as the path as subsided and fallen away down the cliffside to our right. It was an amazing ridge line and one which in good weather would have no doubt given spectacular 360 views. Eventually as neared the peak of Aiguille Croche we emerged from the clouds, revealing the impressive peaks of the Mont Blanc massif once more. The peak of Aiguille Croche itself was no more than 50m above us but was still in cloud so instead of heading up to it we found a comfortable luncheon spot. Cooking lunch at above 2400m and taking in the magnificent view of Europe's highest mountain we felt very privileged to have such a fine dining room. We took the slightly longer and more gradual route back. We could have taken an even longer route back descending to the ski station at Col du Joly and walking the long route back via the ski runs and road but we preferred to stick to the walking paths. So instead we first descending along some of the winter ski runs, past some of the mobile cow milking stations, before then turning off onto a path which traverse the hillside some 500m below the ridge line back to the wooded area where we had started the steep descent some 5 and 1/2 hours earlier (passing all the cows who had just been milked!). From this lower trail, we walked in the sunshine and were treated to stunning views across to Mont Blanc, the glacier Tre de la Tete and also the way up to the Col du Bonhomme, where we'd been just a few days previously, was clearly visible. From the woods, the return to the motorhome passed relatively quickly back along the little road and its switch backs. Contented but tired from our 7 hour hike, we reached the motorhome as the sun was setting on the valley and were both very ready for dinner.